Top quality boot, great fit, and very warm. Bought them for Scottish tour as the reviews have been so good. Not tried them in the rain yet, but so far they are comfortable and warm. Thumbs up. Great service from SBS as usual. Really happy with these boots as they are comfortable and waterproof just as I hoped they would be. Recommended. These boots are really nice. Breaking in nicely after a week of dog walking. Good delivery and keeping my trotters toasty and dry on the bike. Got next day delivery, really comfortable, fully adjustable even for my swollen legs. Checked all reviews before buying but they are what they say, comfortable, waterproof, fully adjustable, strong ,good soles. Just what I needed. Have loads of boots but these are the best by far. 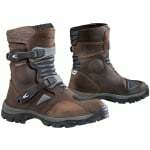 Didn't want to look like a wanna Moto GP be, so opted for these Adventure boots. They are awesome, and you can even walk in them, they look great too. Easy to get in and off, cant fault them at all. They will last ages. Just one thing, I ordered a size 42, which is my size, but they do come up a bit small, so re-ordered a size 43, which are perfect, so suggest you go up a size. The turnaround by the Sportsbikeshop was excellent, great Customer Service. Very comfortable and stylish boots. Provide a larger fitting around the calf, easy to put on and take off. Very supportive. Brought these for my girlfriend, she's 5'11 inch and played rugby so always found it hard to find motorcycle boots to fit her calves but with these she fell in love with the sight and feel of these, in her own words these feel like a cross between moon boots and slipper and I can wear them all day. She loves them so that's a plus from me. Seem a very well made product. Good fit, if on the comfortable side (I bought my usual UK shoe size). Sturdy for adventure riding but not too cumbersome which was what I was looking for. Much easier to put on than my old BMW boots. Pleased with the purchase and service from SBS excellent as ever. Oozes Quality and they seem to fit, brilliant customer service and can't wait to try them out in anger! 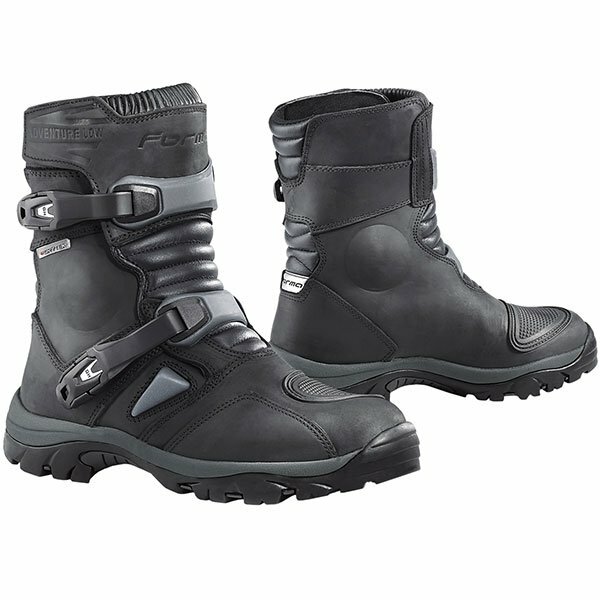 Good comfortable boots and I like the dirt bike look even though I never go off road, but one problem I had was that upward gear changing proved awkward because of the large thickness of the combined sole and upper part of the boot. It was much harder to get my toe under the shift lever to move up a gear compared with my other much thinner boots and I may have to adjust the position of the lever to accommodate this. But doing so would create a further problem in that the raised gear lever would then make downshifts more awkward as I'd have to lift my foot further than before from the rest. Also, I won't be wearing these Forma boots all the time and in warmer weather will often want to wear my more lightweight thinner boots. In that case, if do adjust the lever for the Forma boots, I'd need to adjust it back again. I don't want to have to keep moving the gear lever every time I use different boots so for this reason I have to give them a less than perfect score from my point of view. This is on my Triumph Street Scrambler but it may be that other bikes can accommodate these very thick boots for gear shifting without adjusting the lever position. Bought as a Birthday present for my husband. He rates them very highly for quality, comfort and protection. The sizing was accurate. Not too heavy despite chunky appearance. Look good with jeans or bike trousers.